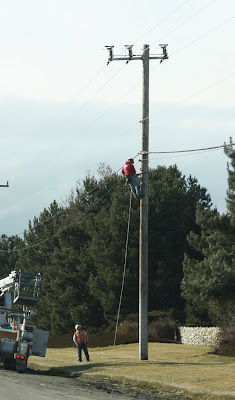 There is actually a lineman college in the Boise area, where people can take training to climb poles and learn to perform other electrical work. This line project is taking place along Chinden Boulevard this week. Sounds like a great avocation for some extreme sports practitioners. I could do that job. It's just the height thing that I have a problem with. Oh, and thanks, now I have that song stuck in my head. Fascinating. I had no idea there were schools teaching this stuff. It does make sense, though. Thanks for the insight!